The Salt Lake Community College Theatre Department will be running a jam-packed production this week in the Black Box Theatre at South City Campus. 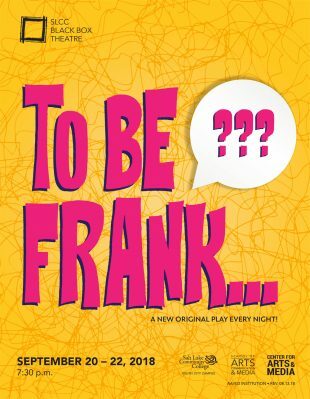 “To Be Frank…” is a series of original works written and produced by SLCC students and faculty. Director Stacey Jenson says the production is quickly paced and aims to cover 30 poignant pieces in one single performance. “Each piece is one to two minutes long, and the goal is to produce all the plays within an hour,” she adds. Jenson says the production will also feature audience participation. “Upon arriving, audience members are given a list of plays and they select the order in which the pieces will be performed next, controlling the general direction of the play,” she explains. Jenson says the format of the play draws its inspiration from a production called “Too Much Light Makes the Baby Go Blind,” a performance that Theater Program Director Zachary Curtis and SLCC theatre major AJ Neuschwander attended in New York City. Each piece requires that the actors are capable of drawing from and conveying strong emotion in a very short period. Jenson says she has no doubts the actors can draw from real, intense “moments of truth” and a wide array of life experiences. According to Jenson, the production includes a piece written by an actor with Asperger’s Syndrome about his experiences, and another piece by an actor regarding his exposure to the experience of being transgender. SLCC freshman theatre major and “To Be Frank…” cast member, RJ Walker, also echoes the notion that “To Be Frank…” requires the actors be open to exploring new emotional territory. “To Be Frank…” runs Sept. 20-22 with performances beginning at 7:30 p.m. Tickets are $10 for general admission, $5 with a student ID and free for junior high and high school students with an ID. What a fabulous article. Will you also write a review? Thanks for covering this, I can’t wait to see it!